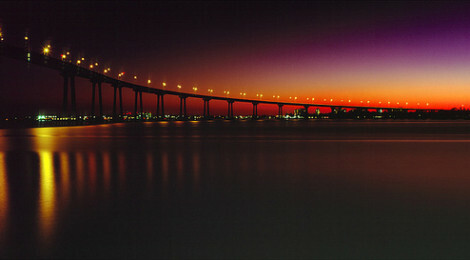 I headed out yesterday with the Fuji G617 to capture a panoramic shot of the Coronado Bridge at twilight. The day had been clear, with offshore winds – so I was expecting a clean sky with wonderful grads as the sun set and twilight kicked in. I hadn’t however counted on my way being blocked by a train – and a big freight train at that – at least fifty HUGE wind turbine blades heading west. This completely killed my shooting window – as I sat watching the railcars inch past, the sky turned from blue to orange to deep blue and black. By the time the rail-crossing barriers raised, the sun had been down for at least 30 mins. I raced to the bay, set up my camera, and metered the brightest part of the sky – it read 1 min at f/22. Using zone, I needed to open up two stops to get the correct exposure, and then another stop to allow for the ND grad filter of the G617. So using my iPhone as a stopwatch, I got this one shot, exposed at 8 min, using a locking cable release to trigger and hold the shutter. So this might be the very upper limit of what I can do for long exposures with this slow film. Although next time, I’ll remember to remove the ND filter to avoid point reflections.